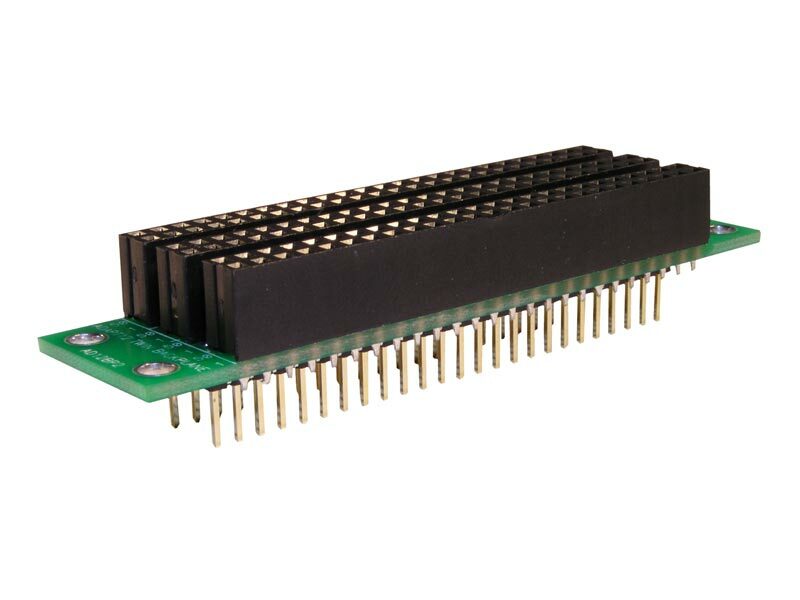 This mini backplane/adapter supports any Adapt12 or Adapt9S12 MCU card in the first slot, and enables you to plug one more accessory cards in the outer slot. The twin card assembly can then be plugged into a standard solderless breadboard, for easy wiring of your interface circuits. The two rows of pins coming out the bottom are spaced 0.3" apart, just like a standard DIP. Typical accessory cards supported are: memory card, prototyping card, and applications cards. To work in this configuration, the MCU card must have RA connector or SB connector on H1. The accessory card must have an RA-style connector on P1 (for cards with a mirror-image pinout, an RA1-style connector is required).